This strange-looking shark has found its way into a fisherman's net in Australia. The shark is a rare species that can be traced back to animals that lived 80 million years ago. It is called the frilled shark, as it has lots of frilly gills down its long body, and it has often been called a 'living fossil'. The shark has around 300 super sharp teeth in 25 rows, to help it catch its prey. 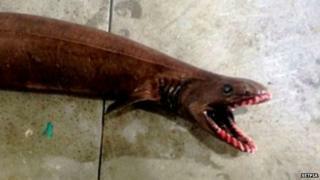 "It was like a large eel, probably 1.5 metres long, and the body was quite different to any other shark I'd ever seen," fisherman David Guillot told an Australian radio station. "The head on it was like something out of a horror movie. It was quite horrific looking." 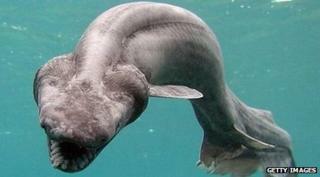 It is very rare to see the frilled shark as it lives in very deep water - sometimes hundreds of metres below the surface.